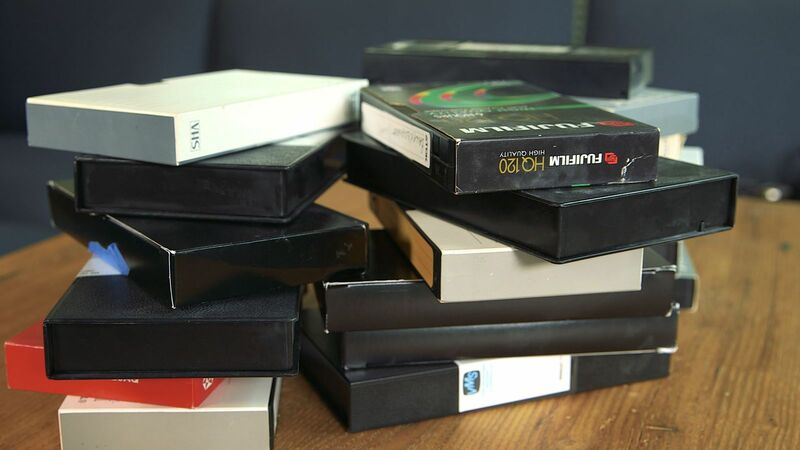 A New York-based team of volunteer archivists and preservationists are working to transfer old VHS videotapes into digital formats. Volunteers meet weekly in a Tribeca loft filled with “racks of tape decks, oscilloscopes, vectorscopes and waveform monitors” to painstakingly digitize cassettes from the 1980s and 1990s. As they note, transferring video isn’t plug-and-go; much tweaking and troubleshooting can be required to get it right. That’s why they’ve only managed to transfer 155 tapes so far – a very small percentage of the total analog format archive. The group partners with artists, activists, and individuals to lower the barriers to preserving at-risk audiovisual media – especially unseen, unheard, or archived works. Whatever the content, once it’s digitized, it becomes publicly available via the Internet Archive. And what about your own tapes? There are plenty of paid services that will help you to digitize old videotapes – or you can do it yourself using directions from open sources. And if you still have a big dusty box of your home video tapes stored somewhere deep in the closet, it may be a good idea to transfer their contents on the new storage mediums. In fact, we have already discussed that in one of our previous articles. Tape manufacturers predicted 20 to 30 years of life expectancy, but media lifespan depends greatly on environmental conditions. Format obsolescence contributes to the crisis: Umatic and VHS tapes are no longer manufactured and BetaSP will soon be discontinued. Machines to play these formats are becoming more scarce as are the skills to maintain and repair them. Of course, it’s not only the videotape that’s at risk. Entropy is relentless, and anything recorded on the old storage mediums will eventually have to be transferred and digitalized. Even if the medium remains intact, formats and interfaces become obsolete and disappear. Preserving data for the long term is a discipline worth more attention than we can give it here, but a few tips might be helpful. Keep track of how long media is likely to last – but remember that the statistics are controversial projections, and many won’t be so precise. The general consensus is that consumer segment CD-Rs should last 30 to 50 years, DVD-Rs less than that, and CD-RWs and DVD-RWs even less. Similarly, tapes and hard disks can be expected to be readable for 10 to 30 years, while portable disks, USB thumb drives, and other solid-state storage devices may survive for half that time, maybe. Back in 2005, The New York Times reported that 3.5” floppies have “an estimated life span of 10 years if stored in a cool, dry place with average care and use”. If you’ve still got any, we’ll bet they’re older than that! 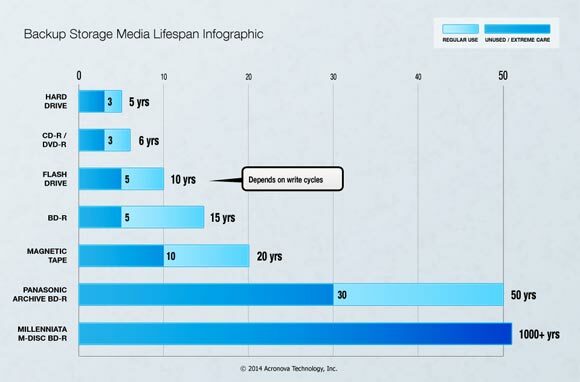 With this in mind, regularly copy data to new media, especially if it’s approaching its expiration date. And make sure anything you haven’t saved is “in a cool, dry place,” not your attic or garage. It is strongly recommended to use a specialized archival optical media, like FalconMedia Century Archival, which are able to secure your data for up to 500 years. Move away from physical formats that are becoming obsolete. For example, many people who used to back up their data on Zip drives, Syquest cartridges, and 1.44MB floppy drives no longer have access to these. Even interfaces can be an issue: external devices often used serial or parallel ports that no longer ship standard on computers (though desktop PC and ExpressCard laptop adapters can still be found). Make sure you’ve migrated your data before you dispose of an old device or format. A common related issue: data trapped on a working hard disk in a dead PC or laptop. The Guardian serves up some useful guidance on installing the drive in an external USB enclosure and restoring from there. Migrate data from obsolete programs, or at least make sure you have the tools to do so when necessary. Millions of people still have content trapped in ancient word processing. Tools for viewing such data or move it into “living” software include Quick View Plus and FastLook; for some formats, the free LibreOffice productivity suite or XNView image viewer might be all you need. TechRepublic offers some useful high-level advice on planning a long-term strategy for protecting your data here. Analog micro-etching: The Long Now Foundation – which specializes in trying to envision the long-term future and solve the problems it might present – ran a full conference on super-long-term data storage. The solution it found promising enough to test: analog micro-etching onto nickel disks. Eight years later, they had a prototype: a disk containing information in about 1,500 human languages, plus translations of the Book of Genesis in each. Since the information is analog, it’s readable directly by humans (though they will need a microscope). The Arctic World Archive: Officially opened on March 27 in Norway’s Svalbard Arctic region, the for-profit Arctic World Archive is already housing key documents from Brazil, Mexico, and Norway — safe, theoretically, from natural disaster and warfare. According to a report in The Verge, data is actually imprinted on special film, in huge high-density greyscale QR codes – and the archive is completely disconnected from the Internet to protect against hackers and ransomware. DNA: According to Science Magazine, researchers have been making breathtaking progress since the first attempts to store data in DNA molecules back in 2012. DNA is ultracompact, and it can last hundreds of thousands of years if kept in a cool, dry place. And as long as human societies are reading and writing DNA, they will be able to decode it – not something you can say with confidence about videocassettes or QR codes.